It’s been a decade since MercyMe released their acclaimed The Christmas Sessions album and they’ve finally answered fans’ demands for another Christmas album in It’s Christmas! and it doesn’t disappoint in the least. If you’re a rocker, a pop lover, country fan or CCM fanatic, there’s something on this album for everyone and something will appeal to you regardless of what type of music you like. There are softer CCM-style tracks like the opening “The Newborn Has Come” and then there’s other tracks that have a more up-tempo 50’s rock style that would fit well at an Elvis concert. There are also songs that combine numerous Christmas classics into one- “The Newborn Has Come” combines “Away In a Manger” with “Hark! The Herald Angels Sing” into one while “Holly Jolly Christmas” also includes a sample of “Jingle Bells,” making for a multi-song Christmas spectacular. 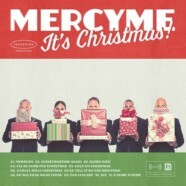 In the end, MercyMe have outdone themselves, taking everything they accomplished on their first Christmas record and surpassing it in a flash. Bart Millard and company have proved once again that they can take on any genre of music and make it theirs, completely owning it all. Even if you’re not a fan of Christmas music, you’ll find something to be appreciated here. If you’re looking for a record to play in the background while you put up your tree and hang your stockings and Christmas wreath, this is the album for you. If you’re looking for something to play in the car on your way to the Christmas service at Church, look no further.